It's been almost a year since the WWE Intercontinental Championship belt that I helped create (along with "The Ace" Dave Millican) debuted on television. The date was June 28th, 2013. The show: WWE Smackdown. The segment: MizTV. Curtis Axel had won the IC title a week earlier on Father's Day, a fitting tribute to his legendary father – and former IC champ – "Mr. Perfect" Curt Hennig. (Hennig was one of my favorites growing up, so to see his son wearing a belt that has my name stamped into it was a very big deal for me.) After some back-and-forth trash talking, Axel and Miz engaged in fisticuffs, which ultimately resulted in the belt being dropped and a large, sweaty wrestler being slammed onto it. I cringed. With joy. If that's even possible. Quick backstory: When WWE brought back the classic "Reggie IC" (named after the iconic belt created by Reggie Parks in 1986), I was elated. 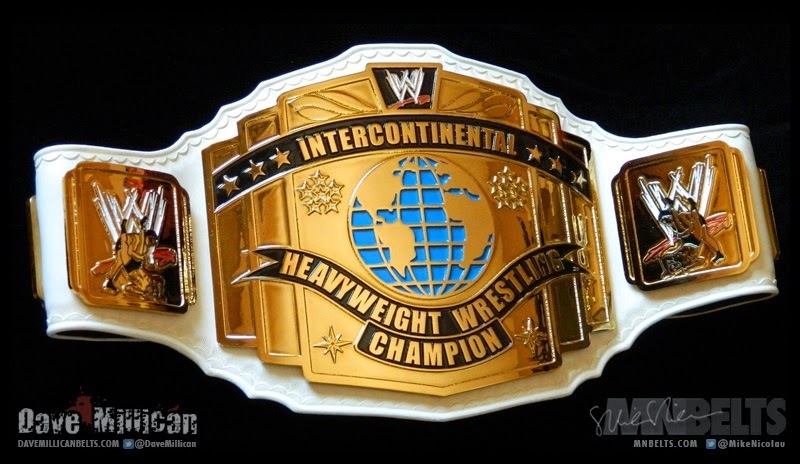 You see, the original design – one of my all-time favorites by far – was replaced by another belt-maker's version of the IC title around 1998, much to the dismay of "beltmarks" around the globe. But in 2012, all became right with the world when WWE commissioned Dave Millican and Rico Mann (Reggie's business partners) to create an updated "Reggie IC" with new logos, modernized artwork, and a white leather strap. The end result was nothing short of amazing. 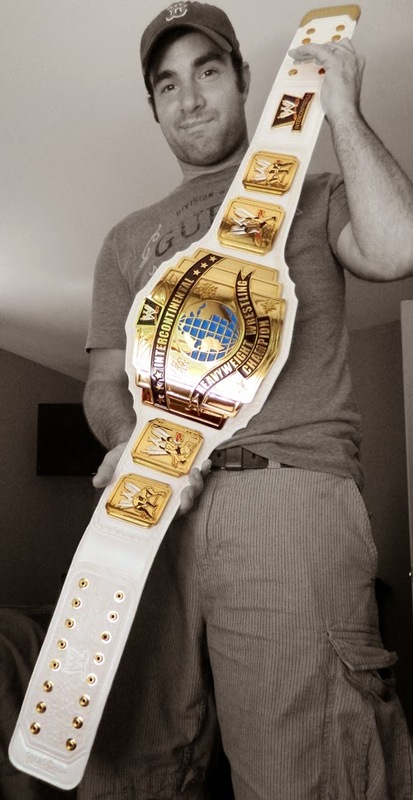 Fast-forward a year or so, and I get a text from Dave Millican asking if I'd be interested in working on a new IC belt for WWE Television (they replace the belts regularly so that they continue to look shiny and new in HD). Once I regained consciousness, I immediately responded with a big ol' "Hell Yes!!!!" 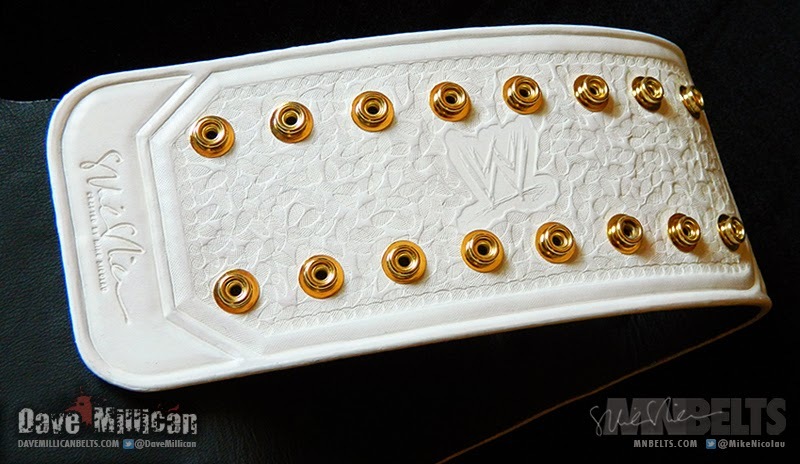 A week or two later, I received a box containing the unpainted plates and a WWE logo stamp for the leather. Once I regained consciousness, I got to work on it right away. Knowing I may never get this opportunity again, I worked meticulously to craft the perfect strap for this prestigious championship. I wasn't thrilled with the way the first one came out, so I made another one, and I saw that it was good. 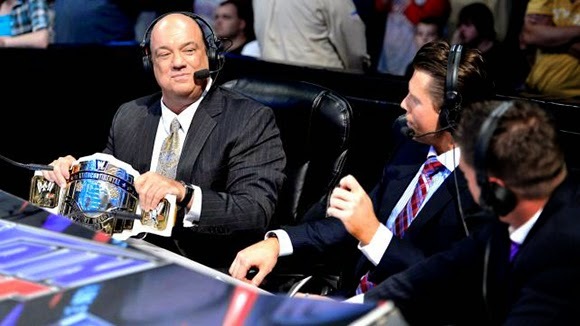 I attached the plates, finished the leather, painted all the little logos and wrestlers and such, and – after taking 4,000 photos – off it went to WWE TV headquarters in Stamford, Connecticut. I agonized for a few days hoping they would receive the package and that the belt wouldn't disintegrate as soon as they opened the box. 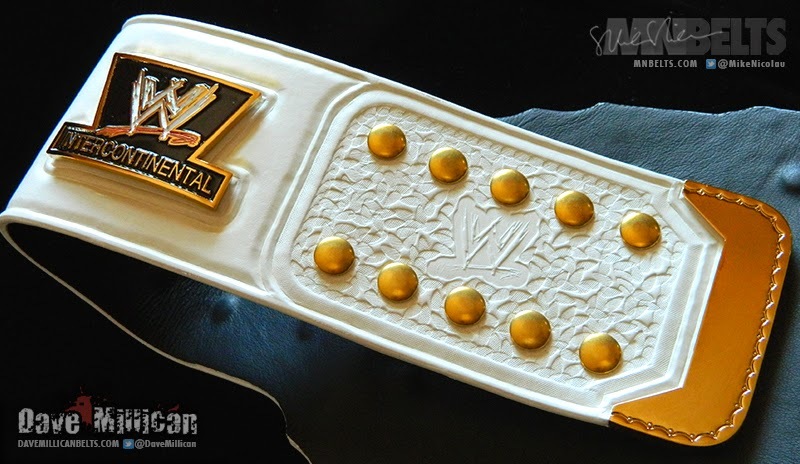 Once I got confirmation that the belt had been received in one piece, a smile crept across my face. And it stayed there. For a while. When the new IC title debuted a few days later, I was completely blown away. Seeing something I had a hand in creating being used on worldwide television (broadcast to more than 150 countries), was surreal to say the least. My friends and family all seemed impressed. My local newspaper even published a little blurb about the achievement, and, most importantly, Dave Millican was pleased with the final result. 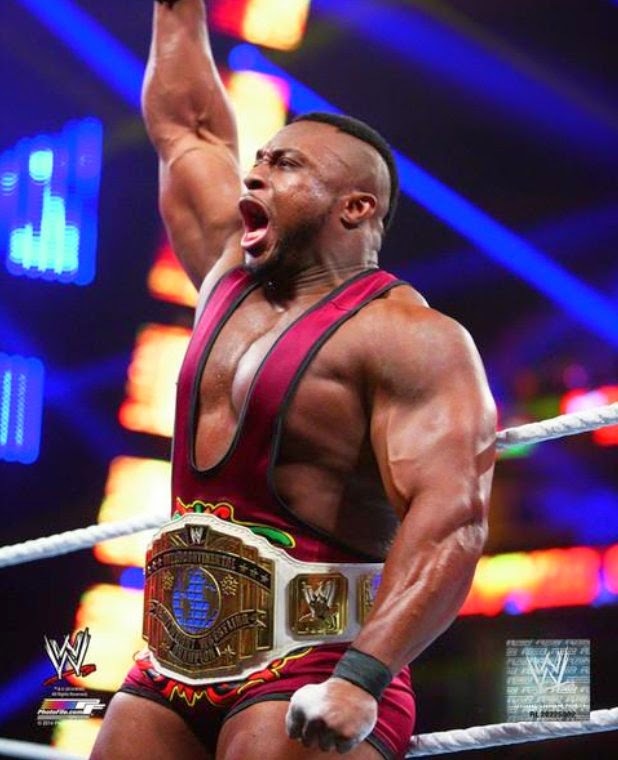 Since its debut, the belt has also been held by Big E. Langston and Wade "Bad News" Barrett. And I've been fortunate enough to collaborate with Dave on belts for 2K Sports and Bellator MMA, along with some WWE licensed belts for private collectors. I don't know if the opportunity to create a belt for WWE TV will ever come along again, but I'm happy that I was able to at least slip one past the goalie. As the belt starts to look more and more worn, I assume its days are numbered. I'll be ecstatic if it makes it to the one-year anniversary, which is in just a few days. I will have a cake and a candle ready to go, just in case. Whatever happens, I will always appreciate the opportunity I was given to fulfill this crazy boyhood dream. Thanks again, Ace.